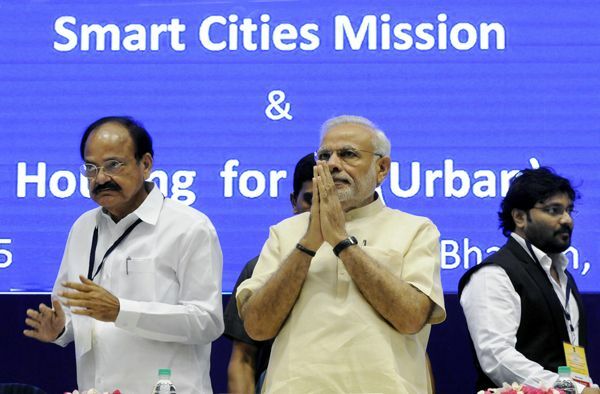 Union Development Minister M Venkaiah Naidu on Thursday announced the first list of 20 cities to be developed as smart cities. In the coming years, the Modi government will announce 40 more cities under its plan to develop 100 Smart Cities in the country. This is the first phase of the Narendra Modi-led NDA's ambitious 'Smart cities' project that has participation from Japan, after a MoU was signed between both the countries to develop Varanasi into a smart city. While addressing the press, Naidu said, "A total investment of Rs 50,802 crore has been proposed in the selected Smart Cities and towns during the five-year period". He said that the Smart City plans had been prepared by the Urban Local Bodies and the States. "The results of the competition revealed the unrecognised strength of the federal structure in our country." The selected cities will be developed to have basic infrastructure through assured water and power supply, sanitation and solid waste management, efficient urban mobility and public transport, IT connectivity, e-governance and citizen participation as reported previously by Catch. Naidu further stated that out of the 20 on the list, 18 cities have come forward for retro-fitting and one for redevelopment. The project saw the participation of 1.5 crore citizens in the planning stage. In the coming years, the Modi government will announce 40 more cities as a part of its plan to develop 100 Smart Cities in India.